Beginning with the abduction of a family of white settlers by Indian raiders, this gripping true story lays bare the brutal conflict that inspired The Last of the Mohicans. The infamous massacre of the garrison of Fort William Henry by the French army’s Indian allies accelerated a cycle of revenge that would end in Robert Rogers’ bloody raid on the Abenaki village of St. Francis, and a harrowing retreat through the frozen wilderness of North America. Robert Rogers created what was arguably the world’s first ‘special forces’ unit and it remains the inspiration for the US Army Rangers of today. He was a complex character, a fearsome fighter feted in the salons of London and New York. 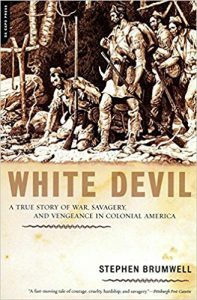 The newspapers hailed him as a hero, but the Abenakis would soon have a new name for him: ‘White Devil’. Susanna Johnson was a typical frontierswoman, living on a farmstead with her family in the 1750s until she was abducted by an Abenaki war party, together with her husband and children. Her account of their ordeal vividly describes the lifestyle of the Abenakis at this critical time in their history. 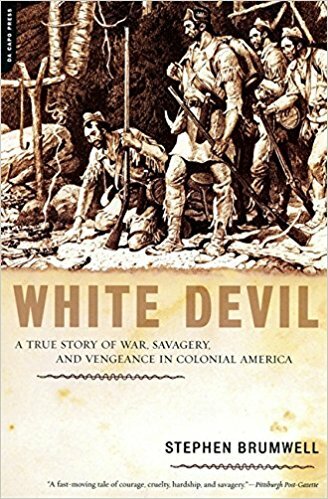 The interwoven stories of Robert Rogers, the Johnson family and the Indian wars make White Devil as riveting an adventure story as the novels and films these events inspired. It reveals the remarkable true story of Rogers and his Rangers: an epic of revenge and survival in the North American wilderness.